Keeping healthy includes getting all the right vitamins in the right amounts, and the best way to get these is through diet rather than vitamin supplements. Here are a few hints and tips to maintain the levels of vitamins in food, and some good sources of vitamins from the diet. 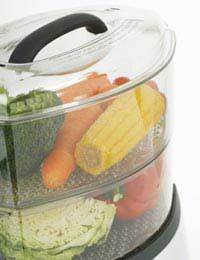 The best way to preserve the vitamins in vegetables is to cook them for the briefest possible time in the smallest amount of water – microwaving in a covered dish with a few teaspoons of water, or steaming will keep the vitamins in, as well as preserve the most flavour. If the vegetables need to be boiled, use the water to make soup or gravy as it will have some of the vitamins dissolved in it. Cooking casseroles and stews in a slow cooker traps the vitamins from the meat and/or vegetables, as well as improving the flavour and tenderness of cheaper cuts of meat. Fresh fruit and vegetables are always a good option for a vitamin-rich diet, especially if they are eaten as soon as possible after harvest. Unfortunately, the vitamin levels do fall with storage, so sometimes frozen and tinned fruit and vegetables can be a better vitamin-rich option. Eating fruit and vegetables in a wide variety of different colours can help people get a range of different vitamins, as well as making the food much more interesting both to look at and to eat. Vitamin A (retinol) – Carrots, cheese, eggs, oily fish, milk, fortified margarine and yoghurt. Vitamin B1 (thiamine) – Pork, vegetables, including peas, dairy products including milk and cheese, fresh and dried fruit, eggs, wholegrain breads and rice bran, some fortified breakfast cereals. Vitamin B2 (riboflavin) – Meat, eggs, milk, rice, mushrooms, fortified breakfast cereals. Vitamin B3 (niacin) – Meat, including beef, pork, and chicken, eggs, grains, milk. Vitamin B5 (pantothenic acid) – Meat, including chicken, beef and kidneys, whole grains, tomatoes, eggs, broccoli, fortified breakfast cereals. Vitamin B6 (pyridoxine) – Meat, dairy products, pork, chicken, turkey, cod, bread, whole grains, eggs, vegetables, soya beans, peanuts, milk, potatoes, fortified breakfast cereals. Vitamin B7 (biotin) – Meat, including kidney, dairy products, eggs, dried mixed fruit. Vitamin B9 (folic acid) – Leafy green vegetables, including broccoli and Brussels sprouts, asparagus, peas, chickpeas, brown rice, fortified breakfast cereals, some bread, oranges, bananas). Vitamin B12 (cobalamins) – Meat, including liver, eggs, seaweed, salmon, cod, milk, cheese, yeast extract, fortified breakfast cereals. Vitamin C (ascorbic acid) – Most fruit and vegetables, including blackcurrants, citrus fruits, peppers, broccoli, Brussels sprouts, sweet potatoes, kiwi fruit. Vitamin D (calciferol) – Sunlight, cod liver oil, oily fish, eggs, fortified foods including margarine, breakfast cereals and powdered milk. Vitamin E (tocopherol) – Wheat germ and wheat germ oil, unrefined vegetable oils including soya, corn and olive oil, nuts and seeds. Vitamin K (phylloquinone/phytol naphthoquinone) – Leafy green vegetables including broccoli and spinach, vegetable oils, cereals, some meat and dairy.